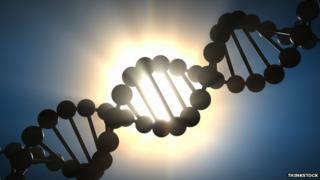 Prime Minister David Cameron has said it "will see the UK lead the world in genetic research within years". The first genetic codes of people with cancer or rare diseases, out of a target of 100,000, have been sequenced. Experts believe it will lead to targeted therapies and could make chemotherapy "a thing of the past". Just one human genome contains more than three billion base pairs - the building blocks of DNA. This four-year project which will look at 100,000 genomes is being run by Genomics England,. Pilots have been set up at centres across England - including sites in Newcastle, Cambridge and London - and the first genome was sequenced on 30 May. The project has now passed the 100 genome mark, with the aim of reaching 1,000 by the end of the year and 10,000 by the end of 2015. The genome of a patient's tumour will be scoured for differences with the genetic code of their healthy tissue. People with rare diseases, usually children, will have their DNA compared with that of close relatives. University scientists and a drug companies will be allowed to access the data for their research. They argue that understanding DNA will soon play a role in every aspect of medicine from cancer to cardiology. Cancer is one of the main areas the project will focus on. Tumours are caused by mutations in DNA which lead to abnormal cells growing unchecked. Previous genetics research has shown how different cancers can be - for example that breast cancer is not one disease but at least 10 - each with a different cause, life expectancy and needing a different treatment. And the development of targeted drugs such as Herceptin, only given if a patient's breast tumour has a certain mutation - has been possible because of genetics research. Fifteen thousand families with rare diseases will take part in the project. Edward Sherley-Price has first-hand experience of just how little is known about some conditions. His 11-year-old daughter Alysia has regular seizures. She was diagnosed with a developmental delay before her second birthday, but the cause was unknown. It took until 2013 for genetic testing to discover what was wrong - a rare genetic mutation in a gene known as STXBP1. The family say getting a diagnosis has given them a renewed sense of optimism. The 100,000 Genomes Project could help people like Alysia by identifying a specific mutation, which lead to taking part in future drug trials. Sir John Chisholm, executive chair of Genomics England, said: "In Britain we were the discoverers of the structure of DNA, we were huge players in the human genome project and now the time has come for the next major step forward. "One hundred thousand sequences is a very large step; it's a huge commitment." Genomics England will be based at the Wellcome Trust Sanger Institute in Cambridge, which is already a world-recognised centre of genetics research. "Twenty years from now there's going to be a plethora of those, we will have a series of mutations which academics and industry will have developed therapies for, which will be targeted at you and specific for that cancer." "We will look back in 20 years' time and think of blockbuster chemotherapy [as] a thing of the past and we'll think 'Gosh, what an era that was'." David Cameron has announced a series of investments across government, industry and charities totalling £300m. He said: "I am determined to do all I can to support the health and scientific sector to unlock the power of DNA, turning an important scientific breakthrough into something that will help deliver better tests, better drugs and above all better care for patients. "I believe we will be able to transform how devastating diseases are diagnosed and treated in the NHS and across the world." NHS England chief executive Simon Stevens said: "The NHS is now set to become one of the world's 'go-to' health services for the development of innovative genomic tests and patient treatments, building on our long track record as the nation that brought humanity antibiotics, vaccines, modern nursing, hip replacements, IVF, CT scanners, and breakthrough discoveries from the circulation of blood to the existence of DNA."